They’re just beat up old chairs, I told myself, wiping away tears as I stuffed the deck chairs into my car. The white Windsor-back chairs had once been part of my prized dining room set. 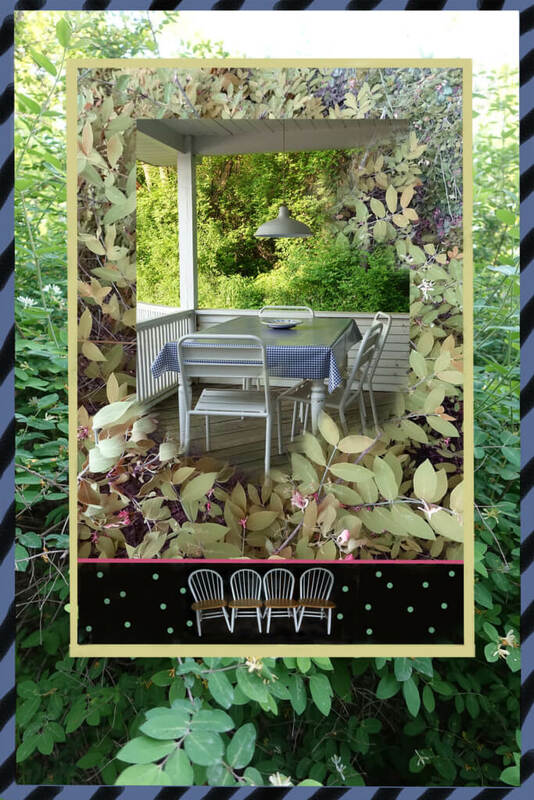 Then, years ago, they were relegated to the deck where we grilled steaks on hot summer evenings, and draped the chairs with towels while we swam in the pond below. Sometimes the kids dragged the chairs off the deck for campfires, and assembled s’mores on the seats. For the past eight years I had little to do with the deck. The three summers before my daughter died, we were in hospitals. After that, I was not able to bring myself out there. The chairs quietly deteriorated. And now they were headed for the Salvation Army, the first stop on my list of things to do before going to the Ithaca Hikers’ Picnic. The four chairs and three cushions (one had been carried off by the wind way back) filled up the trunk and back seat of the car, wedged around empty water jugs. My second stop before the picnic would be the weekly fetching of fresh water at Greenstar Natural Foods Market. In this new chapter of my life, five years after Marika’s death, I am reclaiming the deck and summertime. The past week, in a frenzy of clearing and cleaning, I weeded the overgrown gardens, clipped back the honeysuckle that hung over the driveway, swept years of fallen leaves from the deck, and raked algae from the pond. I replaced the four dilapidated deck chairs. “We can’t take those, they aren’t saleable,” the woman at the Salvation Army said, after I’d unloaded three of the chairs. The chairs felt heavier as I stuffed them back into the car. In shock, I drove to Greenstar. The water jugs were unreachable. So I went on to the picnic. But first I parked in the lot of an abandoned storefront. To cry. Because there would be no new chapter for these chairs; their last stop would be the dump. The last hikers were leaving as I arrived at the picnic. They listened as I held back tears. “Just put them by the road at the end of your driveway, with a sign that says FREE,” they said. So I drove back home, unloaded the chairs, and lovingly lined them up on the narrow strip of grass by the road. And minutes later, when I came out of the house with a sign that said FREE, they were gone. What relics release the floodgates of grief for you? This entry was posted in 2016 and tagged back to summer, cleaning frenzy, free stuff, grieving, ithaca hikers, new beginnings, new chapters in life, reclaiming life, salvation army, second life on 2016/05/30 by Robin Botie. That’s my son’s technique, Robin. It’s worked for me a few times. New chapter after all. I remember claiming my deck. It took a few years to eat there alone or watch a sunset. I began by asking friends to join me. And slowly it became my space again. Wishing you well. Every year feels like a new chapter. For me at five years, my son David got married. A very big new chapter for the whole family. It helped, Elaine. I had a friend come over with a bottle of wine and we sat on the deck watching the evening sky. And now four baby fox peek out at me from under the nearby cabin porch, keeping me company as well, until their mother starts growling and scaring me away. Always new chapters. And maybe these foxlings, the woodchucks, and raccoons that live under the decks here are my extended family. Some folks have weddings and grandchildren brightening up their chapters. I have wild creatures. Cheers, Elaine. I continue to hold onto a beautiful but broken English coffee mug ( part of a set) my daughter gave me. I can still see the eyes that wondered if I’d like them. I feel your heartache Robin! Such lovely posts! Oh, and I remember eyes that wonder, “Will mom like this?” For some reason, it’s the chipped and broken things that I cherish and hang onto. How many times I’ve lovingly bandaged or applied Gorilla Glue in trying to save something filled with memories and love. Sigh. Cheers, Beryl. Thank you, Libby. And welcome to my online home. Please visit often. So great to find you here. It’s summer! So much easier to be light, and find flowers and sunshine. Must try to keep it up, but you know life, Annette.